Magnificent Miceal McCaul wins the All Ireland 3000M title. Heartbreak for Jack O'Farrell in the 1500M. 6th place for David Corkey in the 800M, 4th for Eoghan in the 400M. A brilliant bronze medal for the 4 x 400 squad. The College finishes 9th out of over 90 schools who were competing in the Senior Boys team competition. It was a memorable day for the small but very talented St Colman's College team who contested the 102nd All Ireland Schools Track and Field Championships. Miceal McCaul was definitely one of the favourites for the Inter boys 3000m title, and the tactics were simply to sit in for two laps and then make a move to the front and gradually wind up the pace. The opening two laps went at a fairly pedestrian pace and Miceal right on cue took up the running and fairly quickly the field of 12 went from being bunched together to being strung out in single file as Miceal's injection of pace took its toll on the field. However right onto his shoulder was Michael Moran from Summerhill College Sligo, the All Ireland Schools Cross Country Champion, the biggest threat in the race. Miceal was not prepared to be the 'pacemaker' for the cross country champion, and kept increasing the pace until suddenly he had a 20 m gap then 30 m then 50 m as he took the bell after six and a half laps. Try as they did the rest of the field could not get back to him and Miceal took the win with over 4 seconds to spare. 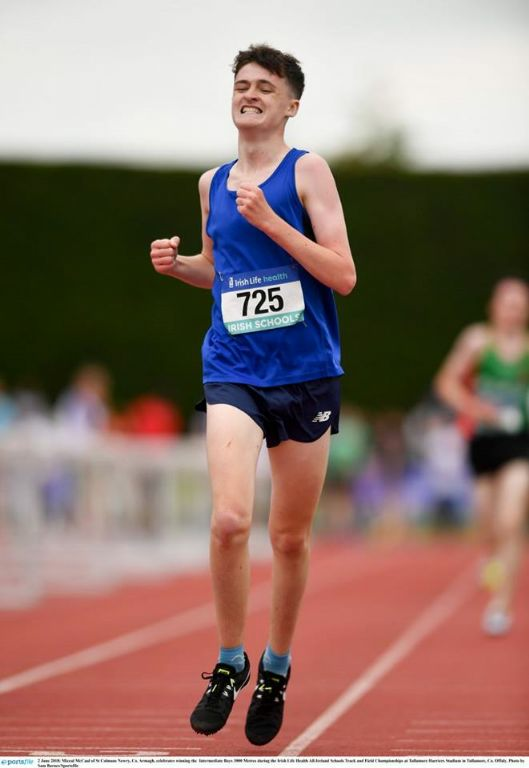 It was the College's second All Ireland track title in two years , Eoghan Byrne having won the 400M title last year, but the first middle distance track title . Well done Miceal on a superbly executed race. In the 800M David Corkey was hoping for a fast opening 400M, however a 61 second first lap put paid to that, but David was in the perfect place at the bell and followed the leaders down the backstraight and was briefly in the lead as they negotiated the final bend where there was a huge injection of pace, which he just could not match, and he finished in 6th place, you could not fault his tactics, as he was in the mix throughout the whole race and gave himself every chance of a podium finish. Sometime sport can be cruel and today Jack O'Farrel sampled a bit of that in the senior boys 1500M. This race was a showdown between two Cork boys, Charlie O'Donovan from Colaiste Chriost Ri and Darragh McElhinney, both of whoum have qualified for the World Junior Championships later this year and in terms of personal bests were well ahead of the field . Jack was hoping for the bronze medal. Charlie had won the Munster schools, and Darragh was looking for revenge. A slow opening 300M had Jack leading with 3 laps to go, when suddenly Darragh sprinted to the front and began a long run for home hoping to run the legs off Charlie and everyone else in the process. Jack reacted quickly as did Charlie and the three of them pulled away from the rest of the field which showed no inclination of following the pace. With two laps to they had nearly 60m on the field , but now they were operating at sub 4 minute mile pace and this was new territory for Jack and gradually a gap started to open between him and the two Cork boys. At the bell Darragh still led with Charlie tight on his shoulder and Jack some 6 or 8 meters behind but with still a good gap on the rest of the field. Down the back straight for the final time Jack was starting to tire and the gap started to close but he held his own round the final bend as Darragh and Charlie battled it down the home straight, some 60m out he still had the bronze medal as Charlie finally got past Darragh , but rest of the field now sniffed blood in the shape of Jack and a bronze medal and with 40m to go three of them passed him and denied him the bronze medal he so richly deserved, as he was the only one brave enough to go with the pace.He has another year in this age group, and will cettainy be a better athlete come June 2019. Eoghan Byrne was in the senior boys 400m and although a year young in this age group came a very creditable 4th despite having been given lane one. Our last chance of a medal came in the 4 x 400M relay, this team had broken the Down Schools and the Ulster Schools record but was still some 5 seconds off the pace of the the best schools in Leinster and Connacht. Lead off man was David Corkey, handing over the baton to Conor O'Carroll the youngest member of the team, brought in to replace Jack O'Farrell whose 1500M race was just too close to the time of the relay, Conor was handing over to Finn McElroy who has been a real find for the College this year, and then Eoghan Byrne on the anchor leg. Could they possibly find 5 seconds and get a medal. A very solid opening leg of 52.9 by David handed over the baton in third to Conor, who although passed very quickly by three other athletes did'nt panic and got into his running down the back straight and clawed back some of the meters , he held his own from there on in to hand over to Finn in 6th, but there was very little between 1st to 6th, Conor's time for his leg an excellent 53.6 considering he was giving away as much as three years to some of his opponents. The excitement was now rising in the stadium as the race was now very close , Finn's opening two hundred meters was blistering as he caught the field very quickly and with 200 hundred to go he was in second place , but it was still a desperately close race with just 3 to 4 meters now separating the first 5 teams and the noise from the crowd was deafening as the third leg runners came down the home straight to pass the baton for the final time, Eoghan receiving it in third place. Finn's time for his leg a brilliant 51.5. On the last leg it was Presentation College Carlow with the winner of the Senior Boys 400 Jack Mitchell, Castleknock College the Leinster Schools Champions, Summerhill College the Connacht schools winners with Leo Doherty a finalist in the 400M and St Colman's. Eoghan went quickly past the Sligo athlete and down the back straight was now in third place ,but it was still a very tight race, could he hold onto what he had ?, With 120 to go Doherty came hard at him , but Eoghan is a very experienced 4 x 400 relay runner and was not to be denied as he tried his best to get on terms with Carlow and Castleknock 50 m from the line , but they held what they had and Eoghan finished in 3 rd place with a wonderful split of 50.4. It was an absolutely fascinating race to watch and credit to all 8 teams for creating a great finale to a fantastic championships.